Make Your Own Lampshades for Fun & Profit! This chapter includes discussion of the different types of lampshades and related hardware, tips and techniques for choosing the right shade for the lamp, information on lighting, and the effect light has on lampshade materials. Excerpts from intro to this chapter . . .
"Considering the effect that lampshades have on the ambience of a room and the comfort level of the lives they illuminate, you'd think people would pay as much attention when choosing them as they spend on picking out much less important home decor accessories (at least more than the throw pillows), but that's commonly not the case. More often than not, we accept the lamp maker's opinion of what shade should be on a lamp, and when the shade disintegrates, the whole lamp is either banished and replaced, or it's topped with a make-do (while the original shade is sent off to storage to await a visit from the lampshade fairy)." "What's so swell about being able to make your own lampshades is that it means you can have just about any kind of shade you want. You can change the covers when you redecorate, or change shades with the seasons, or for special occasions. 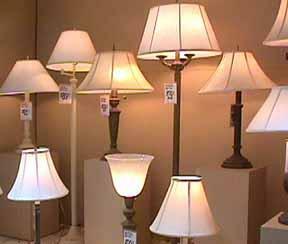 You can buy those swell shadeless lamps, knowing that it's no big deal to whip up shades for them. And you can become your own lampshade fairy. The kindred craft of lamp making (another easy and most-creative endeavor) is also eminently enhanced by the ability to make a shade to go with the lamp. Knowing how to do this also means that you can now have lampshades appropriate to vintage and antique lamps, without having to spend a fortune (if you can even find an appropriate shade), while at the same time replicating the rapidly dwindling original examples." "To me, it's like buying ready-made slip covers or drapes; unless you make them yourself or have someone do it for you, your options are severely limited. The same thing could and should apply to lampshades, but it doesn't. Consider the fact that you can look in the Yellow Pages and find plenty of people offering all manner of other interior decorating services, but hardly anyone (if anyone at all) who can re-cover a lampshade, let alone someone offering custom-made shades. And while scads of information has been published over the past hundred years on all sorts of other crafts and home decorating projects, very little has been written about how lampshades are made. At the antiques shows, and crafts shows, and flea markets, while there may be everything else under the sun, there are hardly any handmade lampshades. You'd think that the tremendous range of decorative possibilities, the fact that everybody needs shades (and many are willing to pay handsomely for them), and the higher price you can get for a lamp with a decent shade on it (let alone a great one) would have attracted more people to this craft. The logical conclusion would be that lampshades must be really hard to do, but the fact is, they're not. They're easy. It's a mystery to me."